Most individuals would rather avoid knee replacement. It is fairly common that both knees have extensive arthritis at the same time. 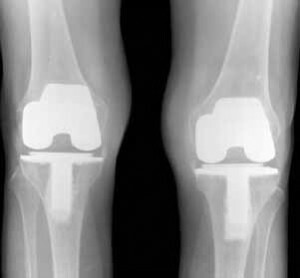 Some patients opt for both knees to be replaced at the same time. This has pros and cons, and definitely is more difficult in the short run. There are times when both knees are replaced successfully, as well as one knee followed by the other. What about when a knee is replaced and doesn’t do well? Some patients will still undergo the other knee replacement. The results may or may not be successful on the second knee replacement. The nightmare is when both knee replacements are not successful. obviously a crystal ball or hindsight would be helpful in making choices. Unfortunately, many patients are never provided with an alternative to surgery. Some patients do their own research, and discover Regenerative Medicine. Regenerative Medicine procedures such as Platelet Rich Plasma (PRP) and Stem Cell Therapy, are gaining popularity as alternative measures to knee replacement. The future will be geared towards addressing arthritis much earlier to alter the degenerative cycle, thus preventing knees from getting to the point where joint replacement is necessary. Alternative measures of Regenerative Medicine will focus on repair and restoring knee cartilage to avoid further wear and tear by means of biologic therapy, Platelet Rich Plasma (PRP) and Stem Cell Therapy. The dilemma of what to do when your told you need two knee replacements may be less daunting when the prospect for an alternative to surgery is provided. Platelet Rich Plasma (PRP) and Stem Cell Therapy may be worth investigating before the question of now what arrives.